This is very true, especially in marriages where it is expected that the spouses will cooperate and share socio-economic and other relevant roles in order to turn their unions into happy and, where possible, prosperous ones. This was not the case for Mr. Abdalah “Madodo” Ali, who suffered from a bilateral hydrocele—a fluid-filled enlargement of the sac around the testes—for over 15 years. 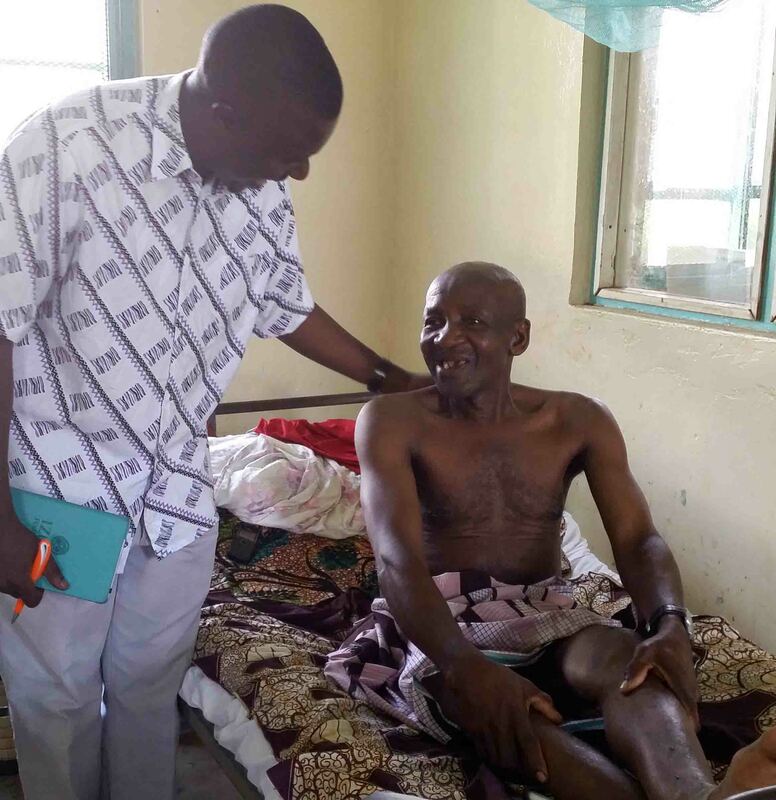 Madodo, a 65-year-old peasant from Mkangara, a village situated in Mtwara Municipality – southern Tanzania, sought help repeatedly over the years but couldn’t afford the surgery he needed. “In the course of this suffering, I visited several traditional healers seeking help but in vain. As a last resort, I decided to go to the hospital. I remember this was way back in the year 2000,” Madodo said. “Although I was diagnosed of having hydrocele and was put on the list of those to be operated, I had no money to pay for the service, so was left to go home unattended. This is the case for many poor men, mainly from the coastal areas, who suffer from hydrocele. A major obstacle that these men face is the health financing system in Tanzania, where almost 90 percent of services must be covered by the patient. There is also an acute shortage of human resources for health facing the country. It is virtually impossible for LF endemic communities to timely access the health services needed to manage their LF-related disabilities and complications. NTDs have only recently started getting attention from policy makers and health planners, but meager resources hamper the treating of symptoms of chronic infection, especially on morbidity management. On Jan. 10, 2015, Madodo had hydrocele surgery, medically referred to as hydrocelectomy, at last. It was made possible through the IMA sponsored Hydrocelectomy Management Service available at Ligula hospital, a regional hospital for the Mtwara region. The grant for this Hydrocele Morbidity Management Project is managed by IMA in Tanzania through a generous donation by the IZUMI Foundation. The project offsets cost sharing for the hospital, provides necessary surgical consumables, and pays a small stipend to surgeons and those who support the operations, as they are done outside normal working time to avoid interfering with the normal hospital schedules and routines. This makes it possible for patients to get free services. The operations are done in a modern way, applying excision technique and localized anesthesia, as opposed to general anesthesia, which brings fear among patients who worry they may not wake up after its application. The project, which started in June 2012 in just one district hospital of Nachingwea in Lindi region through seed money from Presbyterian Church (USA), has expanded to cover four more district hospitals and two regional hospitals in Lindi and Mtwara regions. From June 2012 to the end of January 2015, a total of 1,400 men in Lindi and Mtwara regions, who couldn’t have afforded the cost of service if not for this support, have had successful surgeries and have been able to quickly bounce back to their normal lives. “Science has brought great wonders to the world,” he said. When asked where he heard about the availability of the service, he said a neighbor had just come back from an operation and told him about it. “I said ‘This is the time. God has answered my prayers.’” He went to the Ligula hospital, where he received the surgery and he has healed completely. He added that when the father of the house is sick in Africa, the whole family feels the effects. “I could not work for the family — a shame!” He sighed in disbelief and promised to be an informed advocate for the project. He also made a plea for other men who are suffering. Mr. Abdalah 'Madodo' Ali, a 65-year-old peasant from Mkangara in southern Tanzania, had a hydrocelectomy to relieve his suffering in January 2015. Hydrocele is a complication of the neglected tropical disease lymphatic filariasis (LF) and can lead to difficulty walking, deep social stigma and an inability to work. Though mass drug administration (MDA) for the control and elimination of LF is well supported in Tanzania, help for patients already suffering from chronic LF infection is harder to come by. IMA World Health partners with the Tanzania Ministry of Health and Social Welfare to train surgeons, conduct surgeries and generate community awareness about the benefits of hydrocelectomy.